Today marks World Penguin Day, a special holiday to celebrate some of the planet’s most beloved birds. Dressed for the occasion in their tuxedoed plumage, penguins throughout the Southern Hemisphere are basking in the spotlight. But in Africa? Can penguins even live in Africa? 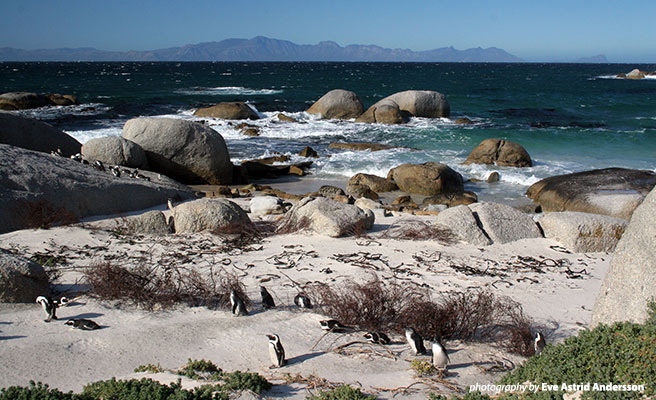 Indeed, this continent boasts its own penguin species—the African penguin—which inhabits Southern African waters. In addition to its distinctive, braying vocalizations—which earned the species its oh-so-flattering nickname, the jackass penguin—this bird can be identified by a long, black stripe across its chest and back and spotting on its white breast and belly. Each penguin has its own unique spot pattern, much like zebra stripes or human fingerprints. Like its penguin brethren, the African penguin is a diminutive creature, reaching up to 28 inches tall as adults and weighing between 4 and 11 pounds. This marine bird normally remains within 40 km of the coast, coming ashore to breed, molt and rest. 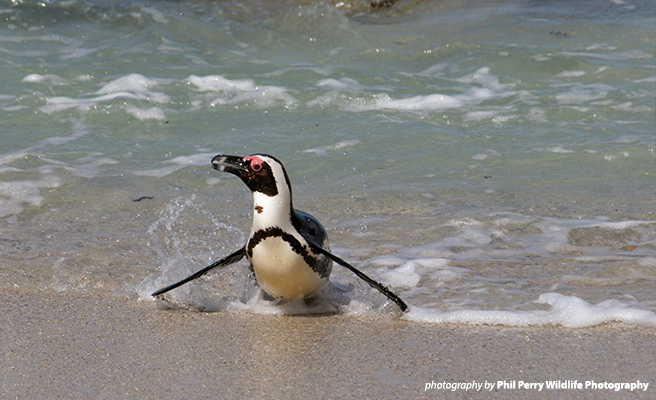 Unlike other species of penguins, however, which cover large distances to breed and feed, the African penguin lives close to its breeding sites throughout the year, normally staying within 400 km. These days, this expert swimmer may be swimming farther than usual. That’s because the African penguin population has declined rapidly in recent decades, largely because of food shortages resulting from commercial fishing. Other threats include collection of eggs and guano—which the birds use to make their nests—accidental capture in fishing nets and oil spills. Two individual oil spills alone in 1994 and 2000 killed 30,000 penguins. 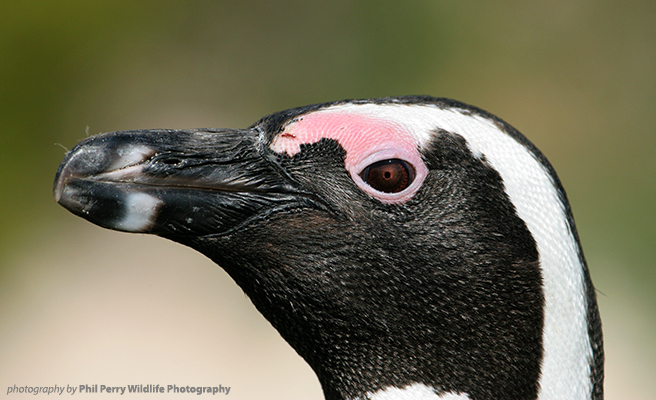 With the African penguin’s entire habitat located near existing or planned ports, the remaining 50,000 birds are at risk. Many of Africa’s wildlife species find themselves in a similar position, facing escalating threats from large-scale development. AWF has partnered with governments across the continent to ensure that economic growth benefits both Africa’s people and its wildlife. Over the past several months, AWF signed agreements with the African Union Commission, the Common Market for Eastern and Southern African States and the Intergovernmental Authority on Development to advise member states on conservation-friendly economic development. With any luck, these efforts will help protect everyone’s favorite flightless marine bird—and many other wildlife species—on World Penguin Day, and every day. Micaela is the Program Design Officer at African Wildlife Foundation and a previous AWF intern. She studied abroad in Kenya and interned with a grassroots NGO in Nairobi. She is passionate about sustainable development on the African continent. President Trump's proposed FY20 budget axes critical funding for programs proven to save the world's most vulnerable species. AWF Blogs bring you to the critical landscapes we work in, where conservation benefits both wildlife and people alike. The blogs are written by our staff - men and women who have dedicated their lives to Africa's wildlife, people and wild lands. Make a gift to protect Africa's most vulnerable species.